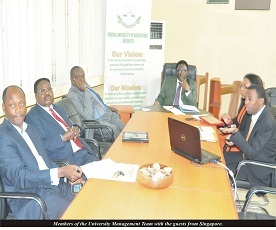 Representatives of Brightsword Technologies, Singapore and the Federal University of Agriculture, Abeokuta (FUNAAB), are now set to collaborate in areas of training and leadership development. Speaking at a parley recently, the West Africa Consultant of Brightsword Technologies, Dr. Raphael Iluyomade, praised the collaborative efforts of both institutions, saying that the country would soon regain the pride it had many years ago. “We are bringing pride not only to FUNAAB, but to Nigeria as a whole”, he noted. 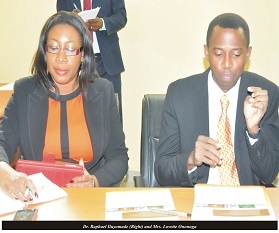 Brightsword Technologies intends to set up a training centre in FUNAAB, a prototype of the one in Singapore, to train students in environmental cleaning, logistics and transport, purchasing and supply amongst others, adding that without the necessary certification, one would not be able to practice in countries like the United Kingdom and the United States of America. He reiterated the benefits of the collaboration, especially in the areas of revenue generation, putting FUNAAB on the global landscape, as well as opening FUNAAB to more multinational companies. He also informed that some of their equipment had arrived and more will be coming in soon. In his response, the Vice-Chancellor, Professor Olusola Oyewole, said the main purpose of the meeting was to discover “where we are and where we are going”, adding that the initiative was not only about ICT, but to address some basic needs in our country today. According to him, “we need added value in the lives of our graduates, hence we must find ways to enhance their skills”… “It is in line with my vision and the University’s vision. We have a team that’s committed to this, we will be professional about it and we will definitely overcome the constraints”… “With our determination, we will make it”. 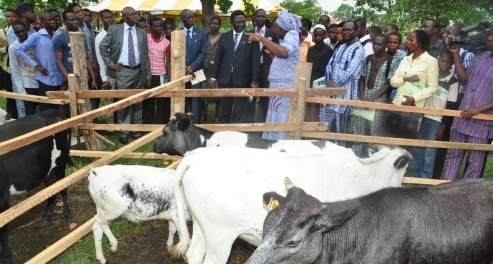 Present at the parley were the Deputy Vice-Chancellor, Development, Professor Felix Salako; Director, Institute of Food Security, Environmental Resources and Agricultural Research (IFSERAR), Professor Akin Omotayo; Director, Vice-Chancellor’s Office, Mrs. Christiana Kuforiji; Director, Centre for Entrepreneurial studies (CENTS), Professor Olufemi Onifade; Director, Centre for Internationalisation and Partnerships (CENIP), Dr. Akeem Oyekanmi and the Acting Head, Information and Communication Technology Resources Centre (ICTREC), Dr. Olutayo Ajayi. Others are the Head, Business Development and Operations, YI Partners, Singapore, Mrs. Lovette Ononuga; and the facilitator of the Project, Mr. Lawrence Kazeem.